If you are traveling on Interstate-85 going northbound, take Sugarloaf Parkway, exit 108, and turn right onto Sugarloaf Parkway. Crossover Satellite Boulevard and Infinite Energy Center will be on your left. If you are traveling on Interstate-85 going northbound, take GA 120 West towards Duluth, exit 105. 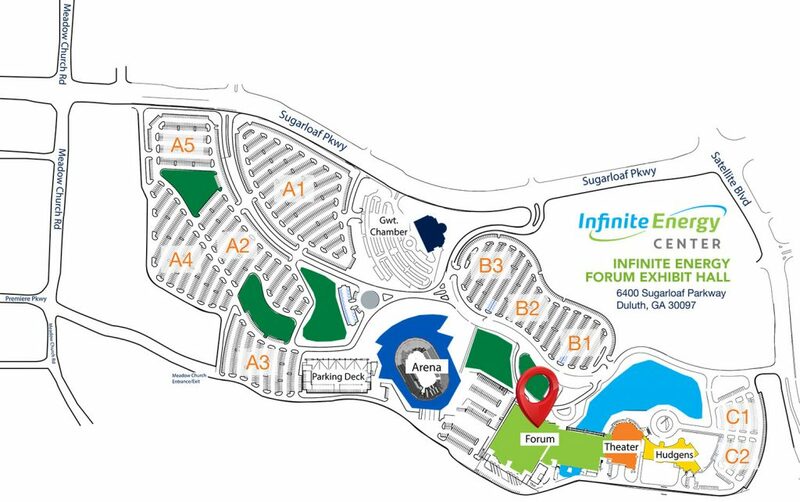 Turn right on Satellite Blvd and Infinite Energy Center will be on your left. If you are traveling on Interstate-85 going southbound, take Sugarloaf Parkway/Old Peachtree, exit 109. Follow the signs for Sugarloaf Parkway and turn right. Crossover Satellite Boulevard and Infinite Energy Center will be on your left. If you are traveling on Interstate-85 going southbound, take Sugarloaf Parkway/Old Peachtree, exit 109. Follow the signs for Old Peachtree and turn right. Turn left onto Satellite Blvd. Crossover Sugarloaf Parkway and Infinite Energy Center will be on your right. If you are traveling from Gwinnett Place Mall, take Satellite Boulevard north for approximately two and a half miles. Infinite Energy Center will be on your left. Infinite Energy Center is approximately 45 minutes north of Atlanta’s Hartsfield-Jackson International Airport. Merge onto Interstate-85 going northbound. When entering downtown Atlanta, keep left to stay onto Interstate-85. Take Sugarloaf Parkway, exit 108, and turn right onto Sugarloaf Parkway. Crossover Satellite Boulevard and Infinite Energy Center will be on your left.